T Racking understand the importance of good packing to prevent freight damage during long time sea freight. 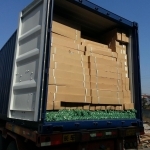 Besides that, proper packing can also save the cost for customer to unload the container. 1.For the customer which have cheap labor cost, we can load all the items by hand, customer can then unload them by hand. This can help maximum container space and save sea freight cost. 2.For the customer which have high labor cost, we can pack all items in bundle, thus customer can unload the by forklift truck. In this case the container may be not full enough but customer can save labor cost. 3. For customer which retail the shelving in supermarket or shop, we can pack all items including assemble instruction in one carton. Such retail package is welcomed by the retail customer.